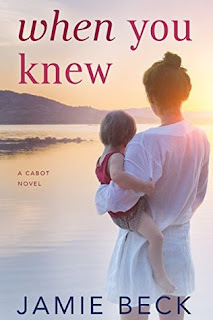 Fans of Catherine Bybee's Not Quite series will enjoy the next entry in Jamie Beck's Cabot family series! When You Knew focuses on Gentry Cabot who is tired of being her family's black sheep. When Ian Crawford becomes her son's manny she learns that it's better to live for herself and her son rather than fold herself into an image only her family will appreciate. I loved this story because Gentry and Ian were total opposites but helped each other become the best version of themselves. Gentry helped Ian to open up and remember that he can help others, carry on his father's legacy, and still have fun and enjoy life. Ian bolstered Gentry's confidence in motherhood and opened her eyes to a life where she doesn't have to beg for her family's affection, but can strike the perfect balance of mutual respect. This contemporary romance is heartwarming with big personalities. The characters are realistic from their insecurities and their expressions of a range emotions. It always kills me when I read stories where the characters are super nice to each other even when situations call for some expressive actions, so it's excellent to see these characters tell each other off or really talk through their feelings. It makes them more realistic and relatable. I believe contemporary romance fans will enjoy When You Knew because it focuses on family. Gentry's circumstances are not ideal but she makes it work because she's concerned about her son's future and doesn't want history to repeat itself. Readers can jump right into the Cabot series even if you haven't read the previous novels. I haven't and I still felt like I got a good picture of the family dynamics up to this point. I was still able to get emotionally invested in Gentry's story so this works as a stand alone. This is my first time reading Jamie Beck, but I'm more than ready for more of her work!